1895 – The lake’s water levels recede drastically and Lake Park closes permanently at the end of the season. Vice President and part owner, Simon Bamberger, makes plans for a new resort further inland using buildings from Lake Park. 1896 – The new Lagoon Resort opens in Farmington at what was then the end of the Bamberger Railway commuter line connecting to Salt Lake City. 1906 – More emphasis on amusements began with the park’s first roller coaster – the Scenic Railway, a mule-driven carousel and Shoot-The-Chutes. The first Davis County Fair is held at Lagoon in October. 1908 – The Bamberger Railway reaches Ogden. 1911 – Horse races began at the new Race Track north of the park. 1916 – Simon Bamberger is elected Utah’s governor. He is the state’s first democratic governor, first non-Mormon governor and the second Jewish governor in the United States. 1918 – An electric-powered Carousel from California replaces the old mule-driven model. 1920 – Farmington Creek floods in the spring leaving two feet of mud in the swimming area. It was cleared out in time for the regular opening on Memorial Day. 1921 – The Scenic Railway is replaced by the new Lagoon Dipper designed by John A. Miller. Over the years it has been known by many names and today it’s simply called Roller Coaster. 1927 – A new Swimming Pool with “water fit to drink” opens just north of Lagoon Lake. 1929 – The Davis County Fair begins to take place annually at Lagoon until 1942. 1941 – The Flying Scooters (known as Flying Aces today), are installed east of the Carousel. 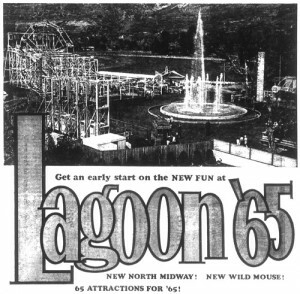 1943 – Lagoon closes during World War II. The buildings fall into disrepair and the gardens are overtaken with weeds. 1946 – The park re-opens under a lease by the Utah Amusement Corporation, consisting of Ranch S. Kimball and the Freed brothers. 1947 – Many new buildings are added and further improvements are made on rides and around the park. 1952 – The trains that brought guests to Lagoon for decades stop running. 1953 – A tragic fire on the night of November 14th destroys the Dancing Pavilion, Fun House, part of the Roller Coaster and the west side of the Midway. 1954 – An ambitious rebuilding effort allows the park to re-open on time with several new rides such as the Rock-O-Plane, Roll-O-Plane, Octopus, Spook House and Tilt-A-Whirl. The most popular addition is the Patio Gardens which featured the top performers in entertainment for years to come. 1956 – Mother Gooseland opens with new rides, play areas and food offerings just for kids. 1958 – A brand new Fun House is completed a few years after the first one burned down. 1962 – Golf-Fun, a professionally-designed miniature golf course opens. 1965 – The Midway expands on the north end to include a wooden Wild Mouse coaster, games and a fountain dedicated to Simon Bamberger’s son, Julian who operated the park for many years. 1966 – The Davis County Fair returns to Lagoon. 1967 – Terroride opens in place of the old Spook House. 1968 – Opera House Square opens with Victorian era buildings and shops. Plays presented in the Opera House starred University of Utah drama students. 1970 – Weekly concerts at the Patio Gardens come to an end. 1971 – A spacious campground is added south of the park. 1974 – An additional dark ride, Dracula’s Castle, opens in part of the old Patio Gardens building. Park manager Robert Freed passes away in July as a result of cancer. 1977 – Two new bumper car rides, Boomerang for big kids and Scamper for little kids, are introduced. 1979 – Tri-Star opens next to Jet Star 2. 1981 – Golf-Fun becomes Putter Around The Park and includes obstacles based on popular Lagoon rides. 1982 – UFO opens for one season. 1983 – Colossus finds a permanent home at Lagoon after traveling in a carnival around Europe for a year. Mudslides in the spring force mounds of debris into the park and cause the park to open later than planned. 1984 – Heavy snowfall during the off-season destroys the European Carousel beyond repair and Red Baron is introduced as a replacement. The Whirlwind spends a season at the park. 1985 – Mother Gooseland becomes Kiddie Land and the old Kiddie Coaster is replaced by Puff The Little Fire Dragon. Cyclone operates for a single year. 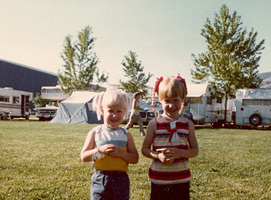 1986 – Relocation of the Davis County Fair allows further expansion of the Midway. Additions to the new area are the Flying Carpet and the Flying Aces, which had been removed a few years before. 1987 – Lagoon celebrates 100 years and adds two rides – Turn Of The Century and Centennial Screamer. The Swimming Pool closes after 60 years. Artist’s concept of Lagoon-A-Beach printed in the Deseret News in 1989. 1989 – Lagoon-A-Beach opens as a replacement for the Swimming Pool. Final season of shows in the Opera House. 1991 – Sky Scraper opens and becomes the park’s first ride to surpass 100 feet in height. 1992 – For better accessibility, ride queues and walkways are modified to better comply with the Americans with Disabilities Act. 1993 – The parking lot is enlarged and reconfigured with a new Auto Gate at the southwest corner. 1994 – Hydro-Luge is installed east of Flying Carpet. 1995 – Sky Coaster opens, becoming Lagoon’s tallest ride. 1996 – A second up-charge attraction, Top Eliminator Dragsters, opens in August. 1997 – Rattlesnake Rapids is added to Pioneer Village and is Lagoon’s most expensive ride up to that time. 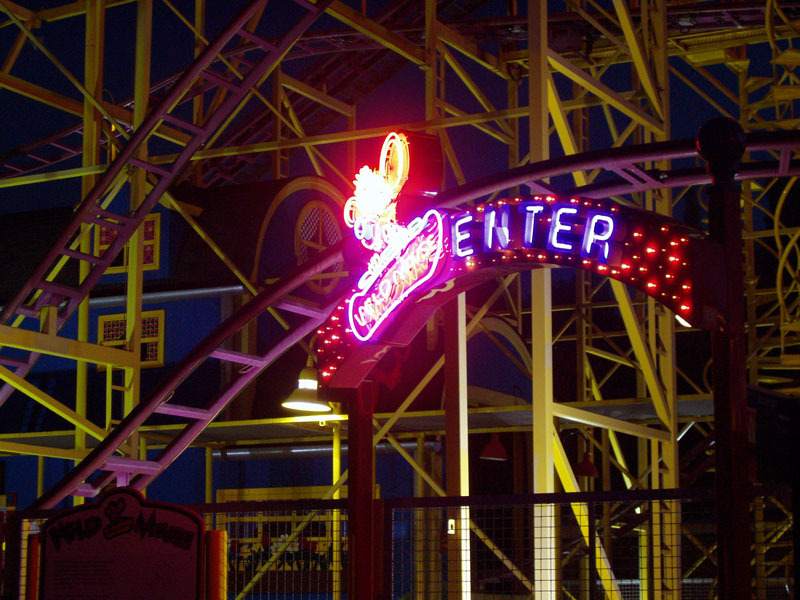 1998 – A new, steel Wild Mouse is installed in the location of the old wooden Wild Mouse. 1999 – The Rocket opens, pushing Lagoon’s skyline over 200 feet. 2000 – Lagoon’s up-charge attractions become known as the X-Venture Zone with the addition of Double Thunder Raceway. Samurai replaces the Flying Carpet and the popular, but aging Speedway, Sr. closes for good at the end of the season. 2001 – Cliffhanger is installed on part of what used to be Speedway, Sr.
2002 – Catapult is added to the X-Venture Zone. 2003 – The Spider opens on another section of land once occupied by Speedway, Sr.
2004 – Kiddie Land is updated and two rides are introduced, The Dragonfly and Kontiki. 2005 – The Bat replaces the old Lake Park Pavilion which had been reconstructed out of a building that originated at Lake Park in 1886. 2006 – Dinosaur Drop and Ladybug Bop are added to Kiddie Land and Bulgy The Whale and Sky Fighter are relocated. 2007 – Wicked, a new, one-of-a-kind launch coaster opens in June. 2008 – A new water ride, OdySea, opens next to the Opera House. Putter Around The Park closes permanently at the end of the season. 2009 – Jumping Dragon opens on part of the old Putter Around The Park miniature golf course. 2011 – The unique family coaster Bombora opens on the edge of Lagoon-A-Beach and Lagoon celebrates its 125th birthday. 2012 – Air Race fills the long-vacant space east of Jet Star 2. 2013 – Tipsey Tea Cups and Red Rock Rally are placed within the boundaries of the former Putter Around The Park miniature golf course. 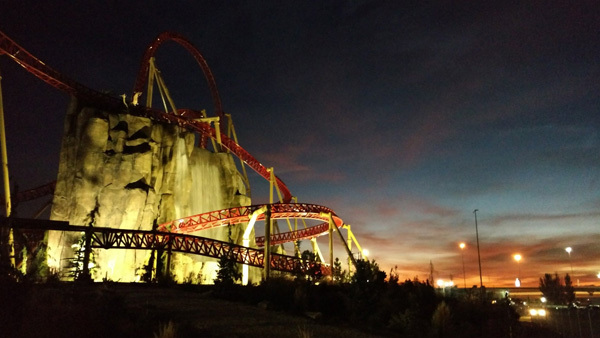 2015 – A record-breaking mega coaster, Cannibal, finally opens after years of planning and construction. 2017 – Flying Tigers and Ruka Safari are added to Kiddie Land and Terroride receives a massive overhaul.